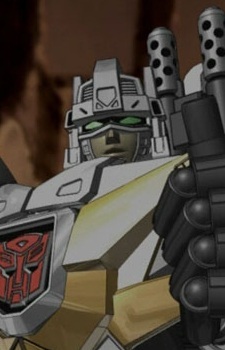 Between the events of Cybertron and the Transformers: Energon animated series, Wing Saber developed a problem with authority, and departed from his duty with the Autobots after a dispute with Optimus Prime over the life of a human astronaut. Rejoining the Autobots on Earth in the midst of a battle with a super-powered Starscream, he renewed his ability to combine with Optimus Prime and become a valued member of his team. At the end he fought Starscream. Wing Saber transforms into a jet resembling an A-10 Thunderbolt II. He is armed with a pair of saber swords (Flap Swords), and can activate the energy cannon mounted on his back with his Cyber Key Power (Galaxy Caliber). He combines with Optimus Prime into Sonic Wing Mode (Sonic Convoy, with the Force Chip special attack Sonic Double Impact).